Remove marshmallow mixture and add 5-10 drops of green food coloring if desired. Stir in the Monster Cereal until evenly-combined. Once the bars have hardened, turn the bars over onto a cutting board and cut into cubes with a sharp knife. Use whatever decor you want to transform the bars into little Frankensteins or monsters! Serve immediately, or cover to keep fresh. Three easy spook-tacular wins to make your Halloween bash the most talked about event of the season! Are you planning a bewitching Halloween extravaganza this year? Or looking for some fun trick-or-TREATS to serve as you’re handing out candy on the 31st? We've got all sorts of terror-ific ideas for you to make it the best Halloween ever! Whether it’s these Frankentastic little Monster Mash-Ups, a haunted Totino’s Graveyard, or these fabulous Glow-in-the-Dark Apple Cider Cocktails, these delicious ideas are sure to make your holiday extra magical. Click on photos or recipe titles below to go to the recipe pages. And check out our slide show of step-by-step pics below, too! Made like traditional crispie bars with a bit of green food coloring and some special detail tossed in, these Frankies will crack you up! First, grab your fave Monster cereal -- Boo Berry, Frankenberry or Count Chocula (or any of your favorite cereals will work). Melt marshmallows and add some green food coloring, then mix in the monster cereal. Press cereal mixture into a greased 8"x8" pan. When the bars are set, turn them out onto a cutting board and cut into cubes with a sharp knife. The fun part! 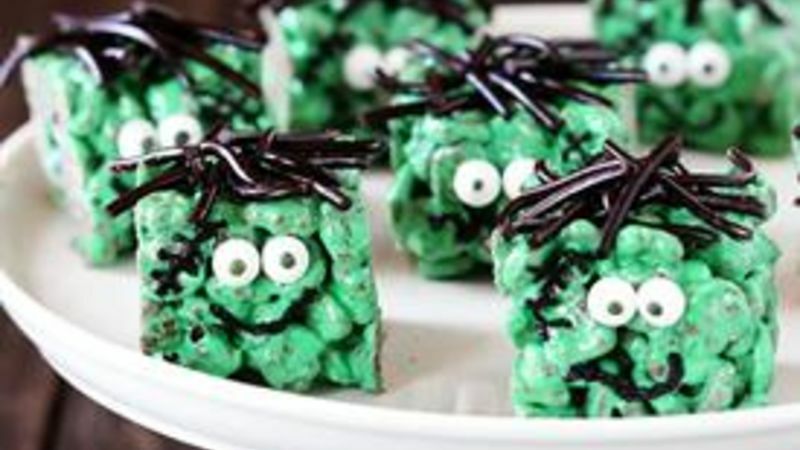 Decorate cereal bars to look like li'l Frankensteins or monsters! Use candy eyeballs, decorating strips, black icing, or whatever you want. Then mwahahaha! These monsters are ready to go! This graveyard is too nom to fear! Totino's gravestones sit in a savory dip made in a snap from Progresso Recipe Starters. Spread the green sauce over the layer of pizza rolls as the "ground." Cover it with fresh parsley as the "grass." Decorate tombstone pizza rolls, if desired, and place them upright in the graveyard. Complete the yard as you want, with signs, ghosts -- and you've got a BOO-ti-ful appetizer! Pick up your fave flave of Totino's pizza rolls. Bake the pizza rolls according to package directions. Prepare the graveyard base, using Progresso Recipe Starters Basil Sauce -- delish! -- and a bit of green food coloring. Lay the baked pizza rolls in rows on a platter. Reserve some to use as headstones later. Seasonal apple cider pairs up with tonic water and a black light to make these drinks glow! You'll need a black light to make these cocktails glow! The next ingredient is super important too -- tonic water -- it makes the cocktails glow under the black light! Mix the tonic water with rum and apple cider. Pop a cinnamon stick in for garnish. Ready, set ... GLOW! Turn on the black light and voila. You're guests are gonna love these! And there you have it -- three super easy, super fun ideas to rock your Halloween party!